We are not in the injector selling business, but have a few injectors that you may be interested in. All injectors have been cleaned and flow tested. Matched sets will include test data. 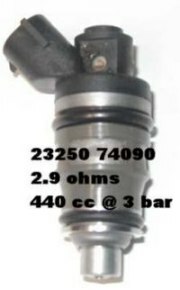 1 (Set of 4) Matched Denso 23250-74090 440cc side-feed injectors with test data.